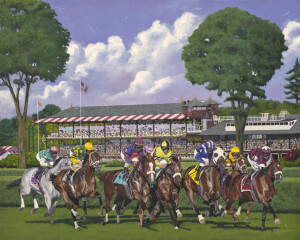 Ordering equine art online, Saratoga 150 gifts, or prints of Nick Martiniz original wildlife or equine oil paintings is easy! Our prints and lithographs are high quality and shipped right to your door. Check out our product FAQ and store policies for more information, or contact me online or by calling (518) 744-3034. What is a Giclle Print? This art print was created using a sophisticated and patented digital printing process known as “Giclle” from the french “to spray”. Using the high levels of precision available, the process delivers a fine stream of ink to saturate the fibers of the heavy weight water color paper or canvas, resulting in pure rich color and exceptional detail that is suitable for museum or gallery display. What is an Offset Lithograph? Offset lithography is a photographic printing technique that uses inks, carried by rubber rollers called printing blankets, to transfer images from metal plates to paper. Limited edition offset lithographs are printed on high-quality, acid-free paper and printed with the highest quality fade-resistant inks. The difference between a regular edition and a regular numbered print is only the number. There is no physical difference from the actual print or proof. The proofs however are more of a collectible artwork because there can only be 50 proofs made by law. A limited edition is a limited run of artwork which is numbered and signed by the artist. The limited number of prints in an edition yields a collectible piece of art. Prints will be shipped 4-7 business days via priority mail once purchase notification has been received. Shipping is included in your purchase. Items must be returned within 30 days of receipt. You are responsible for any costs associated with returning your item. Items must be returned in unused condition in order to receive full refund. If you have any questions please don’t hesitate to call Nick at 518-744-3034.